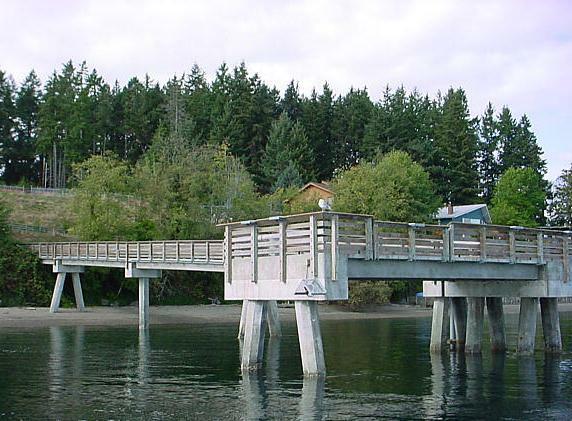 Fox Island Fishing Pier 2001, courtesy of Northwest Cruising. Looking to get away. The fox island fishing pier located on Fox island is a nice little place to take the family fishing that off the beaten path. The Fox island fishing pier is a great spot to mooch for kings when they are running and there is usually minimal competition for a place to plunk in. See for yourself this little pier is well worth the trip for any avid angler. To see our map to Fox Island public fishing pier see our Fox Island fishing pier map below. Fishing for Salmon from the pier is open year Round. This fishery generally allows 2 Salmon per day but only one can be Chinook. Become a member of Lunkersguide.com to view our Lunker location map to the Fox Island Public Fishing Pier.